By hawthornealt in Parent Council on January 18, 2019 . Welcome back from the holidays! As you know, I have been re-elected as TDSB Trustee and I would like to thank all of you again for your support. The ward boundaries have been changed and our new ward includes the ridings of Toronto Centre and University-Rosedale. I look forward to meeting and working with all of you to ensure that we provide our students the best possible education today so that they can be the leaders of tomorrow. Since my election I have already started the hard work of advocating for you at the TDSB. I have begun to amplify our voice by being elected as Vice-Chair of the TDSB. This means that I will be working with all of the standing committees like the Finance, Budget, and Enrolment Committee; the Program and School Services Committee; and the Governance and Policy Committee. 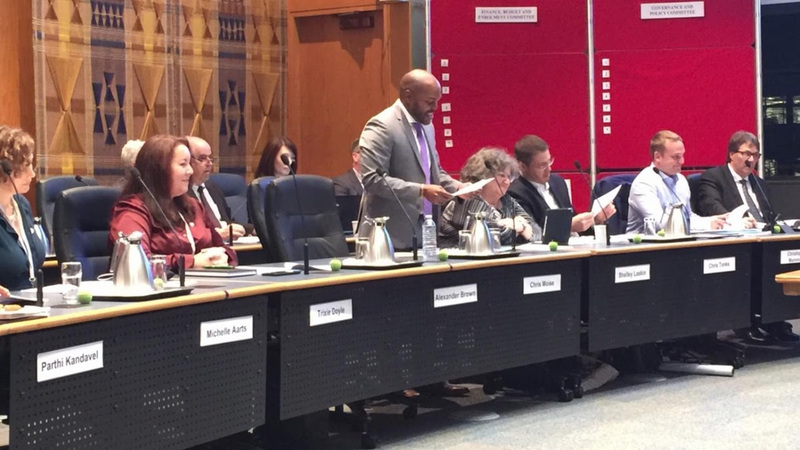 Additionally, I have taken on the responsibilities of working on the Community Use of Schools Committee, the Black Student Achievement Advisory Committee, and the Toronto Lands Corporation. As your advocate at the TDSB I would like to hear from you through Twitter, Facebook, or atChris.Moise@tdsb.on.ca, so that I can respond to any inquiries, suggestions or concerns you may have. The feedback that you provide is vital in my decision-making. I have also already begun visiting schools across the Ward to learn from Principals, students and teachers about the issues effecting their schools. I will continue to make these school visits throughout the year, so please do say hi if you see me in the hall. I also look forward to engaging with you at my first Ward Forum on January 24th, 2019 so that we can continue to work together and improve our schools and communities. My first Ward Forum will be held on January 24th, 2019 from 6-9pm at Kensington Community School (401 College St.). Light refreshments will be served and childcare will be provided on-site. This first forum will include a discussion of the findings about the recently completed Parent Student Census, which is done every four years. We will also have an informal conversation about the cuts to the TDSB budget introduced by the province. We will also be holding elections for PIAC, Special Education Advisory Committee, French Second Language Committee representatives. This is a wonderful opportunity to be involved in the TDSB and I encourage you all to consider running for these positions. Please rsvp by contacting me at my at Chris.Moise@tdsb.on.ca. The TDSB is proud to recognize Chinese Heritage Month during the month of February. The theme selected by the planning committee for this year is Year of the Pig – Happy, Easy Going, Honest, Trusting, Sincere, Optimistic & Sociable. During this month, we celebrate the energetic culture and traditions of the Chinese community with students, staff and community members of the TDSB and the City of Toronto. Time: 1:00 p.m. – 1:45 p.m.
February is African Heritage Month at the TDSB. This is an opportunity to recognize the experiences, contributions and achievements of African Canadians. This year’s theme is Out of Many We Are One. Throughout the month of February, we will be having many educational opportunity for students, staff and the TDSB community to attend. Please see the flyer that outlines some of these events and note the dates and times. Additional information will be shared once it is finalized. A recent study, conducted by Social Planning Toronto (2018), indicated that Toronto is home to a large and a diverse population speaking more than 200 different languages. Over 130,000 individuals living in Toronto are unable to have a conversation in English or French (2016 census). At the TDSB, there are over 120 languages spoken by students and their families. Over 46% of our K – 6 families have a first language other than English or French. Between September 1 and December 31, 2018, there were approximately 3700 interpretation requests covering 60 languages. This chart highlights the top 15 languages supported across the system.